Southern Rockies Nature Blog: All My Flycatchers, Season 10: Fly or Die! Previous episode: "The 'Plop Plop' of Falling Birds"
As I mentioned in the previous episode, there was a built-in design problem. Four fledglings, but only comfortable nest space for three. One, probably the last-hatched by several days, always seemed to be the runt, the usual story. Were its siblings shoving it out of the nest by the first week of July? Despite our efforts — putting a metal sheet between the nest and the top of the porch light where it was built in order to add a sort of safety zone before the drop — I came out a few days later and found the runt outside the nest, stiff in death. The others kept growing and were suddenly starting to look like fuzzy adults. On the 13th I checked them — and one was gone, while another, startled, instead of cowering just flew away, a whole ten feet down to a railing. Later in the day, #3 disappeared. And that was that. No practice flights, just go now! And birds never come back to their old bedroom after venturing into the larger world. It was over. They all dispersed. 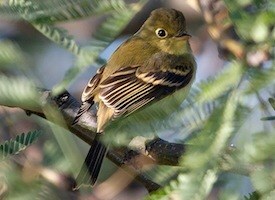 We hear an occasional flycatcher-ish peep! in the trees behind the house. At some point, it will be time to winter in Mexico. M. and I felt a little diminished, that's the funny thing, even though it is nice to not have to duck our heads when going in and out the front door.